My pantry, lately, has become a bit of an eyesore. Its tired, worn and super messy! I even found an empty juice pouch....really?! Once I got it all cleaned out I decided that it needed a bit of a refurbish. One that time and money could handle! Each of the shelf edges were wearing through the cheapy finish on them. All I did to prep the edges was to clean them well and let them dry. The tape adheres securely. As a side note, I love using open baskets to empty out those packages into. All the snacks are together and are handy. I even use a basket in my fridge for all those sticks of butter. The edges look more finished and hopefully distract you from the poor finish on the inside of the cabinet! I even added some tape to frame out my chalkboards. 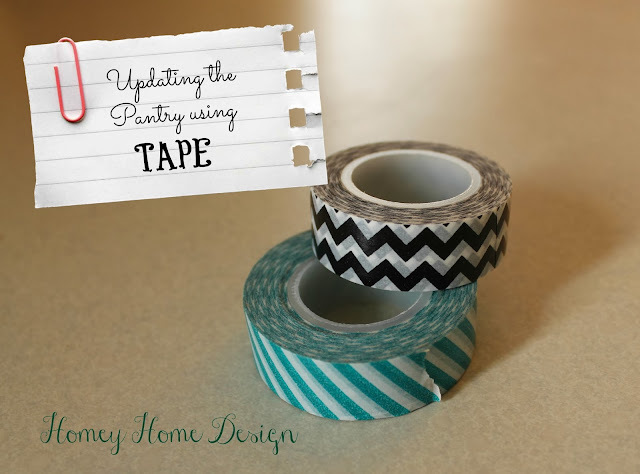 Will pretty tape help you keep your pantry organized? Probably not! Will it look cute anyways, definitely! Making it work~keeping it cute!